If you have travelled in Europe, undoubtedly you have come across a pollarded tree or two. It may have been an old tree with a big trunk and a few strange looking side branches. Or it was a newly planted tree that just looked differently. Why do they pollard trees; how do they do it and can YOU do it yourself? Not every tree lends itself to this form of pruning, but there are some that do, such as: some willows (Salix), ash (Fraxinus), the common lime tree (Tillia x europaea), elm (Ulmus), elder (Sambucus), gum (Eucalyptus), London plane tree (Platanus x hispanica), mulberry (Morus) and the tulip tree(Liriodendren). A tree which under normal circumstances would outgrow its space can be pollarded to fit your garden. It can be pruned into an umbrella shape to provide shade for a small garden or it can be shaped to provide privacy while still maintaining a narrow profile to fit the garden. There are lots of possibilities and it is easy to do. In this presentation you will see how to do it and many examples of pollarded trees in the cityscape and gardens. It will also show a few examples of poorly pollarded trees. Last but not least, it shows you that pruning, including the art of espalier, is not brain surgery. YOU can be creative with pruning shears! 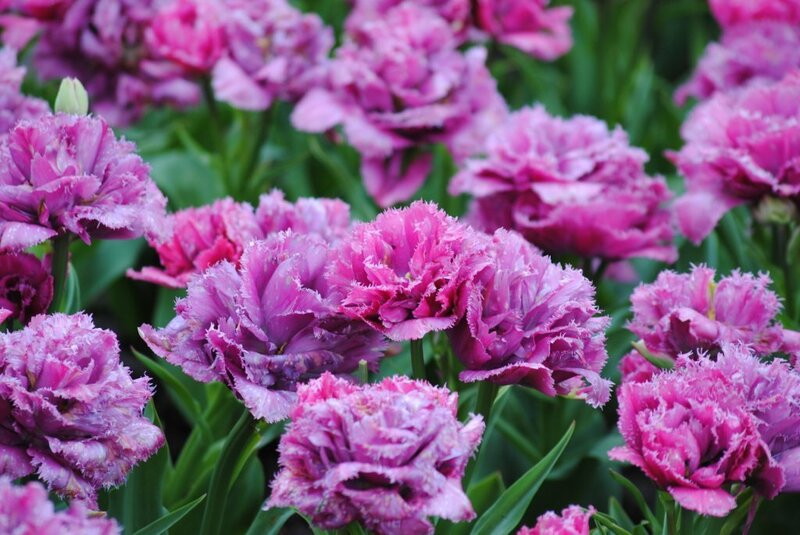 The Keukenhof Garden; spring flowers at their best! The Keukenhof Garden in Lisse, the Netherlands, showcases millions of bulbs donated and planted each fall by the growers and exporters of bulbs in the Netherlands. The word "keukenhof" translates into "kitchen garden" and it was the herb garden for Jacoba van Beieren's castle which stood nearby. Jacoba van Beieren was an interesting woman in Dutch history and you will learn a bit of her history as well. Each year the Keukenhof is designed around a different theme which makes visiting the park even in consecutive years a new experience. 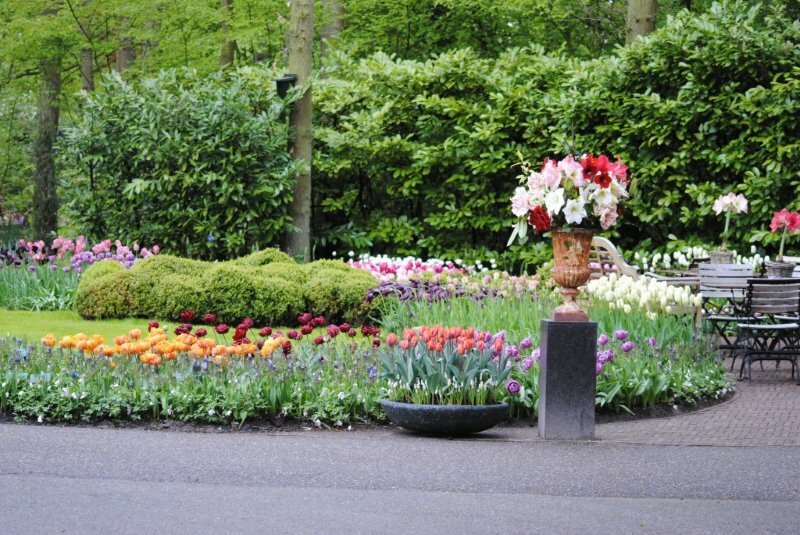 The Keukenhof opens each March and remains open for about two months. During those days you can visit the gardens to see its spring splendor including many (older) trees, spring flowering shrubs, streams and ponds with fountains as well as many works of art, all surrounded by a sea of blooming bulbs. There are pavillions throughout the park which provide a haven from cold and rainy weather (typical spring-like weather in Holland) and which will showcase orchids, newly introduced bulbs or even those not yet introduced and named, but (so) different from the rest. If something in the park catches your eye, write down the name of the grower and the variety of bulb and you can order them right there in the park. The bulbs will be mailed to your house in time for the fall planting and you can start desiging your very own spring splendor. This presentation is especially appealing in mid to late winter when you need a shot of color. 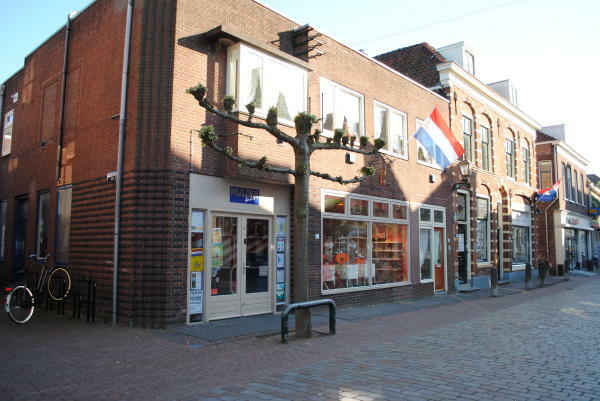 Holland is a small and densely populated country. Walking around the older cities (and they are pretty much all old) and the smaller towns you will notice tiny little gardens in front of the many, many row houses. 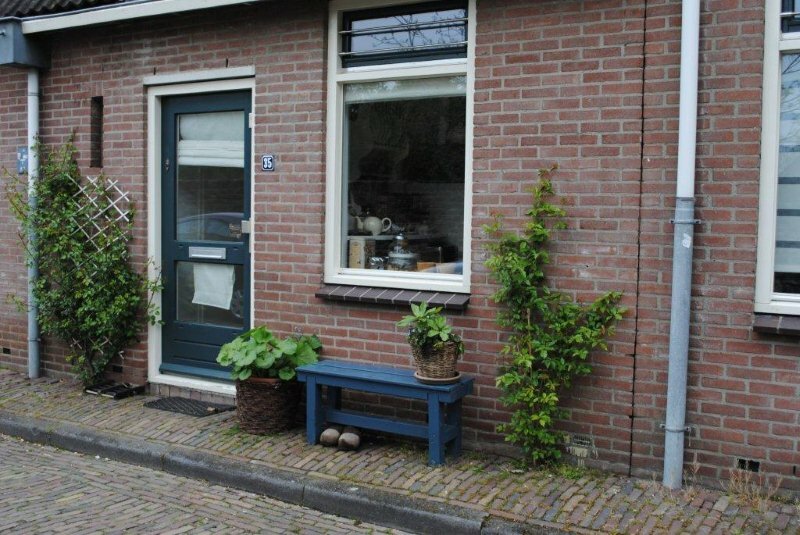 Even if there is no garden in front of the house, the Dutch will excercise their green thumbs by decorating sidewalks with containers or plants stuck in the ground after a few bricks were removed from the sidewalk. Walking down a street you might find a formal French looking garden next to a very informal English styly cottage garden, next to a Zen style garden or a small pond tucked away among a riot of plants. Here and there you will find a pollarded tree to provide shade for a small sitting area or as a screen from the neighbors. Some homeowners collect plants and try to find space for each new find, while others go decidely minimalistic with paving stones and a few (potted) plants. 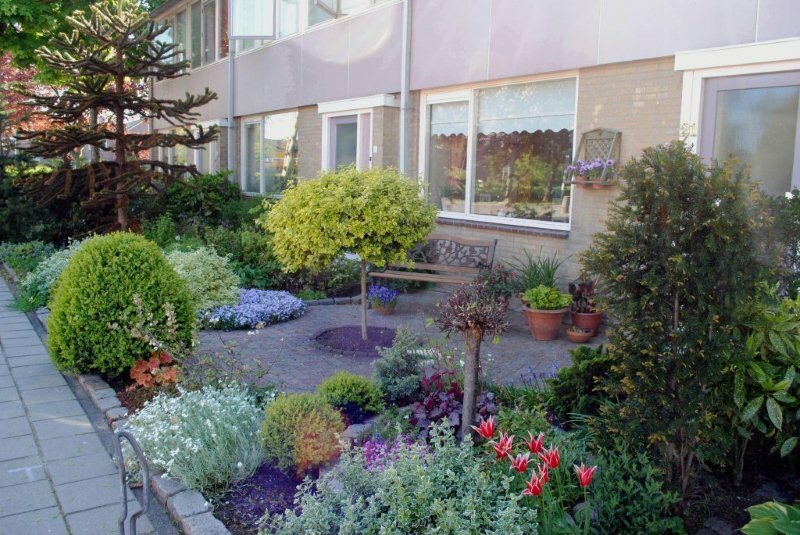 In a culture such as ours obsessed with front lawns with a few foundation plantings, you will see how the Dutch put their love for plants front and center for the world to see and all without a blade of grass. Without a doubt, the Longwood Gardens in Kenneth Square, PA should not be missed by anyone who enjoys gardening or horticulture, but even a non-gardener will enjoy the sights and sounds of the gardens. The history of the garden virtually starts in 1700 when the Peirce family purchased the land from William Penn and started a working farm. In 1798 two Peirce brothers, Samual and Joshua, started an arboretum on the grounds. This arboretum became the start of the Longwood Gardens when Pierre S. Du Pont purchased the property to save the trees as the property was to be sold for its lumber. Longwood Gardens is situated on 1077 acres and has 20 indoor gardens and 20 outdoor gardens. Its splendor includes magnificent formal gardens with fountains which rival anything you can find in Europe. The conservatory is one of the largest in the world and while you can view many different types of gardens in the conservatory, the children's garden is a pure delight for old and young alike. 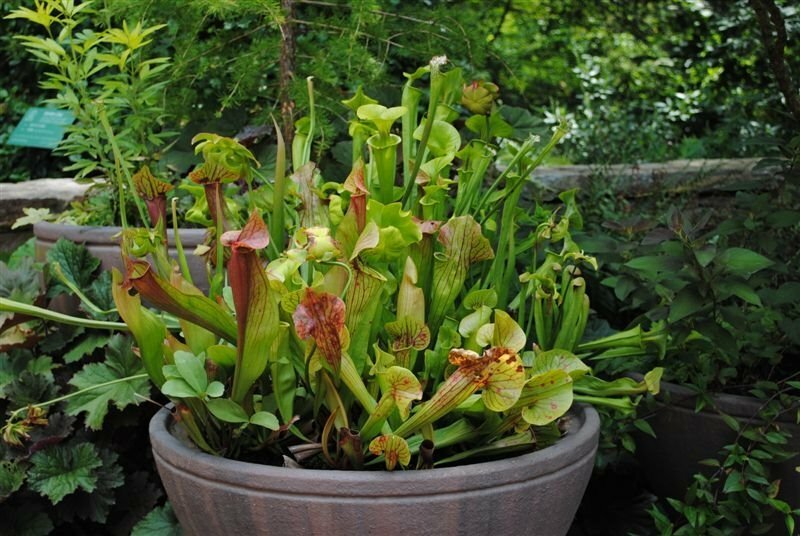 There are many gardens, ponds and buildings to be explored, but off the beaten track you will also find potted plants and little pocket gardens. Pierre Du Pont's first flower garden is a study in garden design. This presentation will show you the sights Longwood Gardens is famous for, but will also provide a more close up view of plants, gardens and designs. The title alone is quite a mouthfull and this presentation is a bit longer than the rest (about 1 hour). It can easily be broken up in two separate presentations; creating the habitat and IPM. In the (combined) presentation I will show you how to create a backyard which will attract butterflies and other insects and birds. Of course, it might also attract some animals you may not want in the backyard, but there are ways of dealing with these critters as well. The IPM part of the presentation will show you how to manage pest damage in an effective and environmentally sensitive way. It shows how you can prevent damage, use good bugs to deal with bad bugs and design a pest resistant landscape through bio-diversity. The use of IPM fits perfectly when creating the backyard wildlife habitat and may put you on the road to earning your own wildlife habitat certificate from the National Wildlife Federation. The "Gardens of Appeltern" in the Netherlands provide examples of over 200 gardens and styles of design or design elements. Whether you are looking for a balcony garden, a place to lounge with or without a kitchen, a pond, jacuzi or pool, a perennial garden or anything in between you will find it here. This presentation will give you design ideas for your garden.